This site provides an overview of the property Quipsberg/Cypher Kop. This 1600ha property is situated on the edge of the impressive Oorlogskloof gorge. 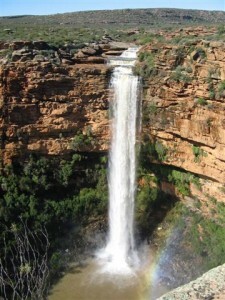 The waterfall is 180 meters high and spectacular in rainy as well as dry seasons. This is an ideal opportunity to buy into a lifestyle that offers peace and tranquility amidst this private “nature reserve” This unique property with it’s unspoiled nature, spectacular rock faces and rugged terrain lends itself to an investment where every investor can own and develop his property in such a way to not interfere with his neighbours privacy. We hope this website provide you with an idea of the the magnificance of this pristine natures paradise! This scenic and tranquil eco farm has magnificent views in every direction, and is ideally situated for eco-tourism. To further accentuate the essential beauty of this property a gallery of photos is included for your perusal.